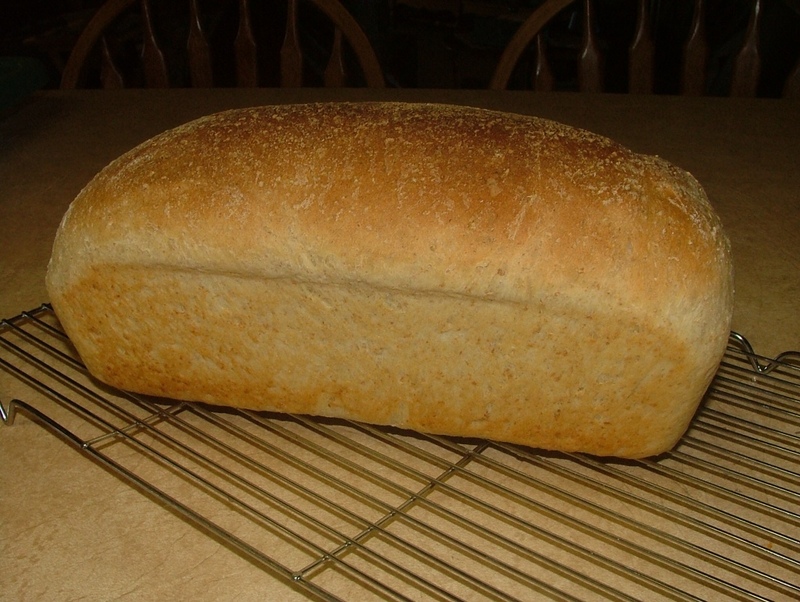 It's always good to have basic bread recipe you can make from memory. 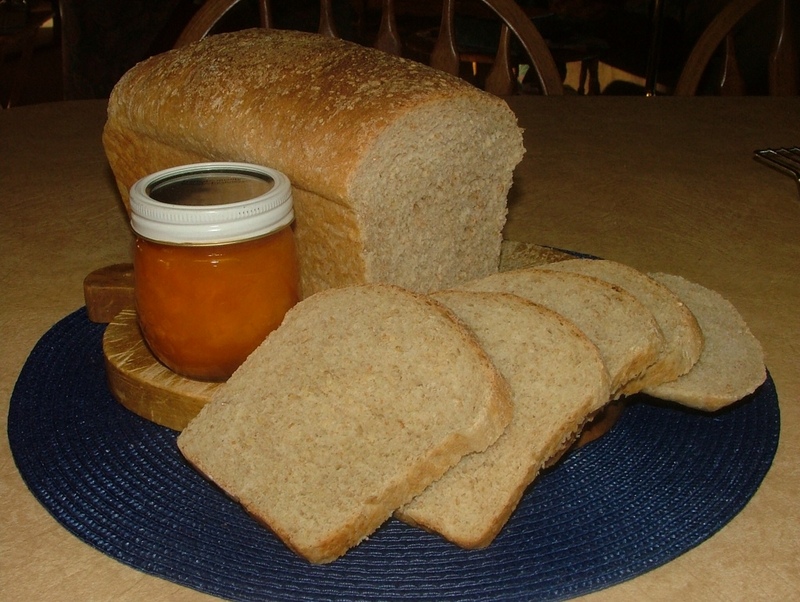 I developed this recipe over time, to provide my family with an all purpose bread that has both flavor and texture, as well as, healthy ingredients such as, honey, wheat and oat bran, ground flax seed, and 6 grains. While I make other breads, this is the one I make twice a week without fail, 52 weeks of the year! This recipe has been developed for use with a bread machine. 3 cups unbleached bread flour, make a well in the center to add yeast. 1 tablespoon SAF instant yeast, may be purchased at Smart and Final or on the Internet. Remove bread pan, making sure the bread paddle is in place. Add ingredients to bread pan beginning with warm water and ending with bread flour. 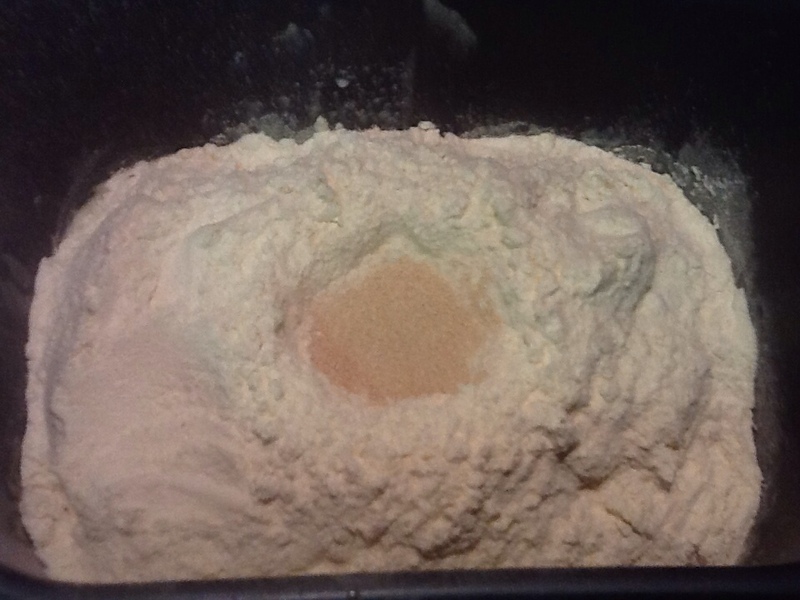 Make a well in center of the flour and add yeast. When bread machine is finished, gently push dough down. 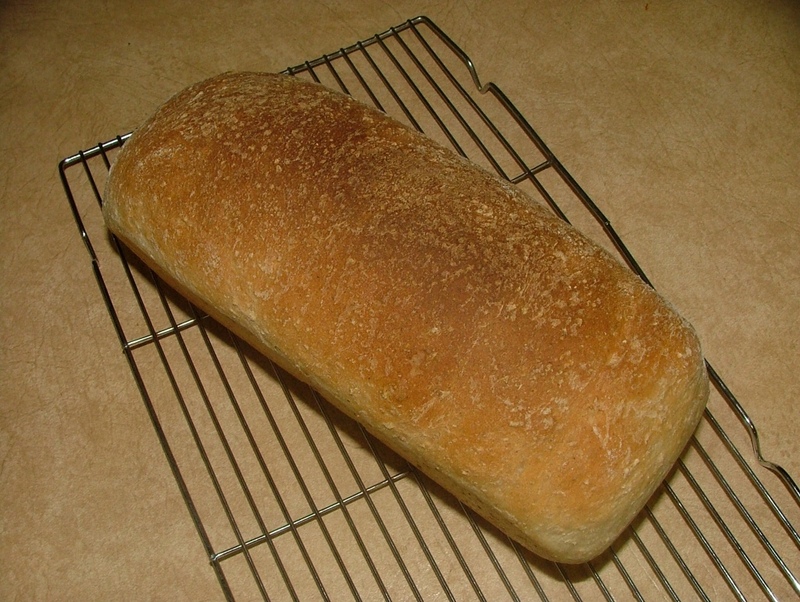 Lightly flour counter and form bread into a loaf and place in a greased bread pan. My bread pan is 12-inches by 4 1/2- inches and gives us 18 slices of bread. Cover bread with a tea towel or greased plastic wrap draped lightly over bread (My greased plastic wrap is folded up and stored in the bottom of my bread basket to use again and again). Keep bread a warm place to rise. I use my microwave oven with the door almost closed and the light still on. Set timer for 40-45 minutes. When timer goes off preheat oven to 350F. Remove plastic wrap or towel and bake for 25 minutes. Cool on wire rack completely before cutting. This is a beautiful loaf of my daily bread. Of course the Grands like their homemade bread with some of Gram's jam! If there was one thing you could change this year, making healthy bread for your family would be a great place to begin. 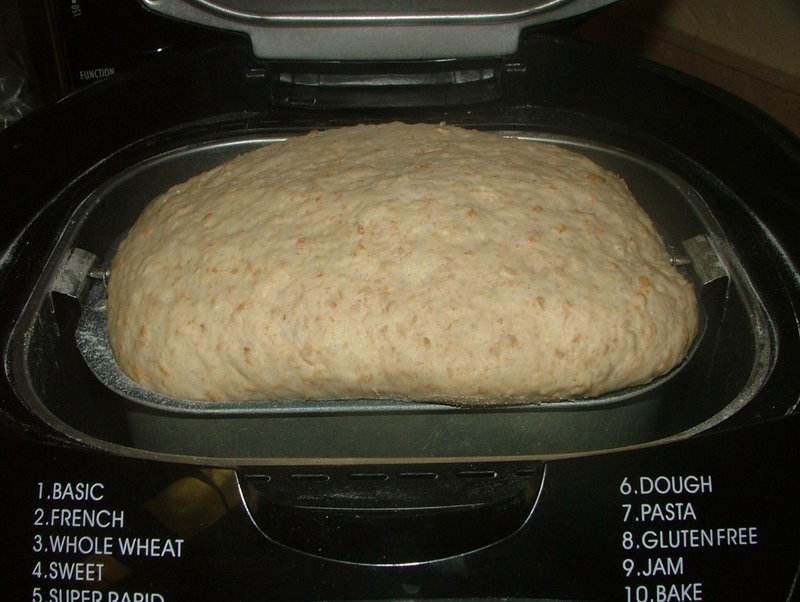 It is so simple to do with a bread machine! The mess is kept to a minimum and cleanup is just a quick wipe on the counter and hand washing your bread pan and paddle. Ground flax can be purchased at Sam's Club or Costco. The brans and 6 grain can be purchased in bulk at your health food stores. I purchase them when on sale and store in the freezer. Bake up some happy, healthy memories with Julie's Daily Bread! 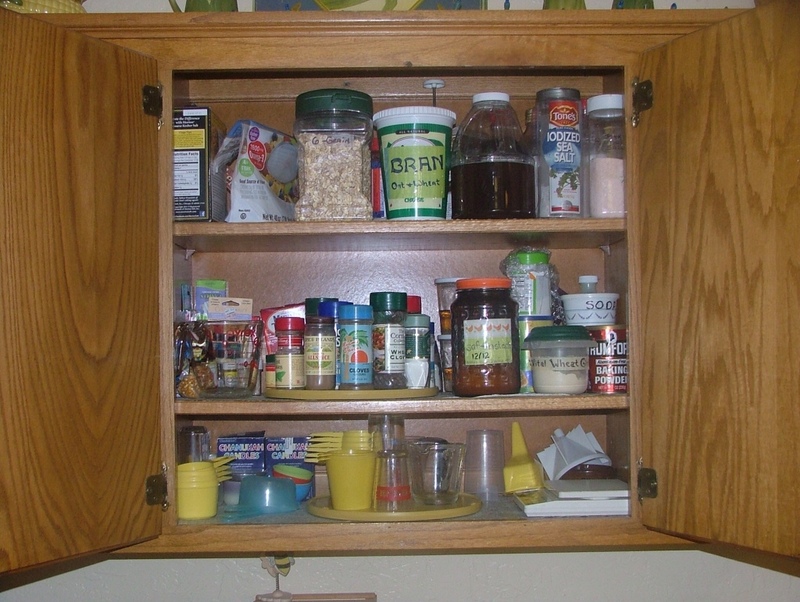 I keep my flax, 6-grain, bran, honey, salt, yeast and measuring cups all together in the cupboard to make putting my bread together easier. I think Will and I have a pretty good thing going . . . I bake the bread, Will slices it (perfectly), and he eats the majority of it! It's a win-win situation . . . Over at Julie's!!! I bake all my breads in the oven, a bread machine makes horrid bread in my opinion! I use the dough cycle on my bread machine because it saves on mess and time and does a great job on the first rising without having to clean out the mixing bowl and then greasing it for the 1st rise. I use a large Hamilton Beach toaster oven, which btw I purchased for the purpose of baking my breads using half the energy and cutting down on heating up the kitchen and, as you can see by the photos, it does an incredible job! If you have a Sprouts around you can purchase your brans and 6 grain there. Happy baking! That would be so fun to have a toaster oven for things like this. I have a boche mixer for the mixing and it's great. No fuss, no mess. I already make my own buns and I have made my bread in the past but lost my recipe in a move and haven't found a suitable replacement. I finally tried the recipe. I don't have a bread machine. So used my kitchenaid mixer. It worked perfect. The family loved it. Jason told me how good the bread was! He told me what you said, "It was so easy! Why didn't I make this bread sooner?!" I want to make this bread recipe but would be using my kitchenaid and not a bread maker. would i just add all my ingredients into the kitchen and then knead?? Any suggestions would be appreciated. thanks for a fabulous site. You will need to proof your yeast first . . . Put yeast in a 1-cup glass measure with 1/4 cup of warm water. Stir to dissolve yeast. Let yeast sit for 5 minutes while you are getting out the rest of your ingredients, then you can add your yeast, the remainder of water and the rest of the ingredients to your mixer. When you are done kneading your bread dough, wash out your mixing bowl, dry it, grease, put in dough, turn dough over to grease top, cover and let rise in a warm place. If you do it that way, it should turn out just fine!